Use the included level editor to create your own crafty levels and upload/download them to test other ninja's skills. Run, jump and wall-slide trought hundreds of levels in pursuit of the ninja's ultimate goal; gold. Avoid deadly ninja-killing enemies as you make your way through each level. One moment of hesitation and you're history. 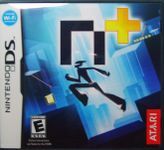 Based on the cult phenomenon "n", enter the challenging world of "n+" where your speed and ninja skills will be put to the ultimate test, build your ninja skills by taking old-school platforming action to the next level. Outwit and outrun deadly enemies.